Woah, it looks ancient! Looks like it got a lot of use before it was retired. Great picture! 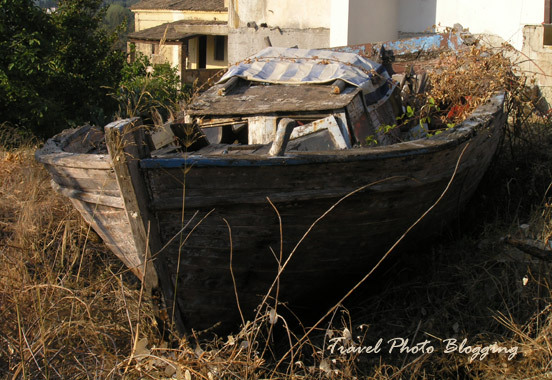 This photo was taken on the Greek island of Corfu. If you take a close look you can even see the cover on the boat is in Greek colours. I wonder where that boat has traveled to! Sadly, it is no longer sea worthy. Excellent capture. I only wish I knew the stories. I bet it would be a pleasure listening to them. I guess the time for final rest comes for everything and everyone. Such is life I guess.